Despite a shrinking economy, Russia’s military budget continues to rise. During a conference call on February 3, Russian Minister of Defense Sergei Shoigu announced that the Russian Air Force and Naval Aviation, the air branch of the Russian Navy, will receive more than 200 new aircraft in 2015. Already in 2014, the Russian military received 250 new planes and helicopters – including new Su-34 bombers, Su-35 fighter jets and Mi-28 helicopter gunships. This is all part of a massive military expansion and modernization plan which between 2011 and 2020 is budgeted to cost the Kremlin up to 20 trillion rubles. “Under the framework of Defense Procurement and Acquisition program, the Air Force and Naval Aviation will receive 126 new military aircrafts and 88 helicopters. And long-range aviation serviceability rates will be set for 80 percent,” the Russian defense minister announced on Tuesday. He further underlined that the Russian Air Force’s “equipment with modern weapons will increase to 33 percent, while the serviceability status [will increase] up to 67 percent,” which means that two out three aircraft will be operational at any given time. Back in December 2014, Russian military authorities were talking about receiving 150 new aircraft in the new year, citing the state defense order for 2015. This order has now apparently been updated. The 2015 state defense order includes Sukhoi Su-34 bombers, multipurpose Su-30SM Su-35S fighter jets, Yakovlev Yak-130 advanced trainers/light fighters and Ilyushin Il-76MD-90 transport planes. According to Sputnik News, the Russian military’s rotary wings will receive Kamov Ka-52 and Mil Mi-28N attack helicopters, Mi-8AMTSh assault-transport helicopters, Mi-35 combat helicopters, and Ka-226 utility choppers. In addition, Shoigu broadcasted that the military will in all likelihood fly the twin-engine, single-seat SU-35D, a 4.5 generation fighter jet, this year, after a finishing additional quality assurance trials. “Currently, we’re testing a new multifunctional fighter jet Su-35S. This year the new aircraft should enter service (…) This is the main task for this year.” The export version of the Su-35S will be priced at $85 million, which makes it cheaper than its Western European counterparts, the Eurofighter Typhoon and Dassault Rafale. 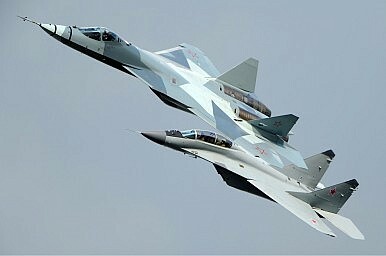 The Russian military will also continue to develop its fifth generation fighter jet, the Sukhoi T-50, of which the Russians are expecting to sell 1,000 worldwide as an alternative to the American F-35 Lightning II. The Russian Air Force’s massive expansion appears to be in line with recent statements by Russian officials. “The task set by the president not to allow anyone to get a military advantage over Russia will be fulfilled no matter what,” the Russian defense minister said on a different occasion last week. Japan’s Ministry of Defense misidentified a Su-35S Russian fighter jet intercepted by Japanese aircraft on September 19.